Preheat oven to 400 degrees. Coat a 9-inch spring form pan with cooking spray. In a large microwave bowl, add zucchini, onions and garlic. Drizzle 1 teaspoon olive oil over the top. Microwave for about 4-5 minutes until the vegetables are soft. Season with a little salt and pepper. Coat a baking sheet with cooking spray. Add peppers and eggplant to the pan. Drizzle 2 tablespoons olive oil over the vegetables. Toss well to coat. Spread out the vegetables over the entire pan. Place in the oven and roast for 30-40 minutes until soft but not browned. Remove from oven. Place each vegetable in a single overlapping layer. Begin with half the eggplant and next add all the red peppers. Sprinkle with half the cheese and a little salt and pepper. Add all the zucchini and onions. Next, the yellows peppers. Sprinkle with remaining cheese and a little salt and pepper. Finally add the remaining eggplant. Cover the top of the vegetables with a 9-inch round piece of parchment paper or waxed paper. Place another cake bottom, cake pan or plate on top and weight it down with a few heavy cans or jars (over time the weight holds this torte together). Place on a larger plate or baking sheet (it will leak) and refrigerate for several hours or overnight. Before serving, place on a platter or cake plate and serve at room temperature or slightly warmed. You’ll love this amazing vegetable dish to serve along side just about any main course meat such as ham, beef, lamb, or even fish or chicken. It’s one of our all time favorite recipes from the Barefoot Contessa’s recipe book. It makes such a beautiful presentation and tastes amazing. We’ve made ours much skinnier by adjusting some of the ingredients and adding just a small amount of olive oil and Parmesan cheese. We’re also cooking some of the vegetables in the microwave to save on sautéing in oil. Theirs is made in a 6-inch spring form pan and we’ve made ours in a 9-inch spring form pan. The larger pan makes more servings. A skinny serving now has only 89 calories, 4.5 grams of fat, and 2 Weight Watchers POINTS! 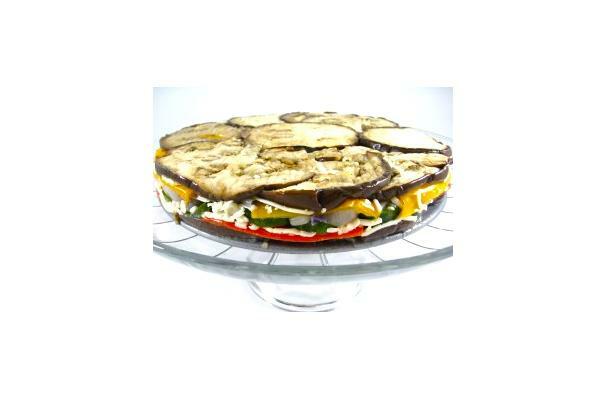 Made with the full amount of oil and cheese has 140 calories and 10 grams of fat for the same size torte and serving. This is a truly a spectacular vegetable side dish that will wow your guest.